By the year 2026, Russia and the United States hope to begin the construction of a space station to orbit the Moon. This project would mark the beginning of a new age of space exploration as the station will be used as an intermediary between Earth and the rest of the solar system. With the space station, NASA and Roscosmos want to explore the lunar surface, creating the potential of a lunar base, and explore the different areas in the solar system like other moons, planets, asteroids, and whatever else they can find. One of the first missions that they hope to launch from this space station is the mission to Mars, using the spacecraft Orion. Based on current analysis of Mars, scientists believe that there was once flowing waters and, most likely, life on Mars. What remains today is a shell of its former self that has become inhospitable to humans and most lifeforms as we know it. As many organizations begin their preparations to explore Mars, they are faced with a few obstacles. The Martian atmosphere is extremely thin, hundreds of times thinner than Earth’s, and really cold. The average temperature on the surface of Mars is about -67℃ and it can get as low as -140℃, which occurs during the night and at the polar regions, and as high as 20℃, which is on the dayside during summer. Besides the cold, which is difficult enough for humans to tolerate, the atmosphere is mostly carbon dioxide with minute traces of oxygen and other gases. One of the biggest problem for humans and majority of lifeforms on earth is the exposure to solar radiation and ionization. Because the atmosphere is so thin, Mars is continually bombarded with radiation that can gravely harm organic lifeforms. Despite this, researchers believe that if life existed on Mars, there should still be traces of it on or below the surface. They also believe that there might be areas on the planet that life could survive, if not thrive, in. There could be life deep underneath the surface of Mars, which would be very difficult for us to find without actually going there. Russian researchers recently published their paper on testing microorganisms to see if they could live in situations that were similar to the polar ice caps on Mars, which would be another candidate to find any traces of life. Researchers from Lomonosov Moscow State University wanted to examine how long microorganisms could survive in an environment that was analogous to the polar ice caps, made of carbon dioxide, on Mars. To begin they set up three groups of microorganisms, which were a natural group of prokaryotes, a group of cultured bacteria, and the third group was made up of archaea. The groups were within ancient Arctic permafrost sedimentary rocks that were held under low temperatures (-50℃), low pressure (1 Torr), and dehydration conditions. These conditions were meant to simulate how microorganism might be when they are below the sedimentary rocks of the Martian polar caps. These groups were then exposed to gamma radiation at doses of 100 kGy, to also simulate the radiation levels on Mars. 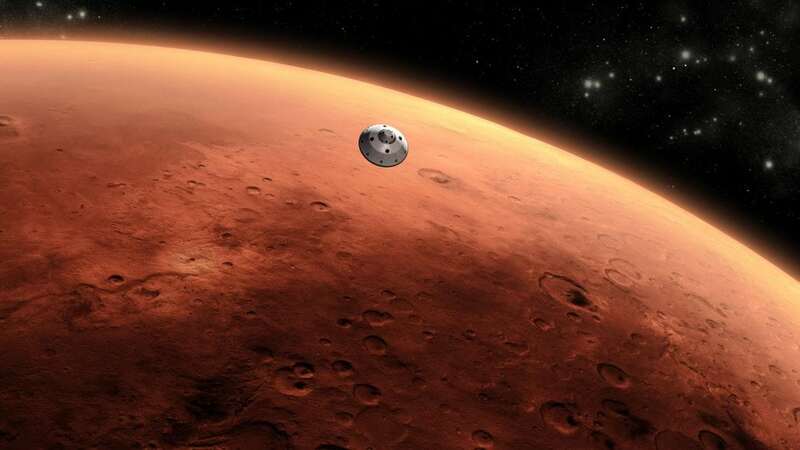 The ultimate goal for the researchers was to examine how long these groups could survive under constant absorption and accumulation of the gamma radiation dose in a martian environment. They compared the results to a control group, which was not exposed to the conditions. The researchers found that the cell count and metabolic activity for the first group were the same as the control group, which meant that it was not affected by the constant bombardment of gamma radiation. The second group ended up with 10 times as fewer numbers as the control, which is attributed to physiological changes rather than cell death from radiation. The archaeal group experienced a threefold decrease in metabolically active cells. The researchers also noticed high biodiversity of bacteria in the permafrost samples, made up of the natural prokaryotes, which is important because it signifies the many different kinds of microorganisms that were able to survive this ordeal. One of the other developments that occurred within the natural group was a population increase for actinobacteria populations of the genus Arthrobacter. These actinobacteria became the dominant group of bacteria within the sample because they are more resistant to the radiation and environmental conditions compared to the other bacteria within the sample. Overall, the researchers showcase the high resistance that prokaryotes have to gamma radiation due to their ability to enter a preservation mode as well as protect and heal their DNA from damage due to radiation exposure. This is significant because it shows that it is possible for life to survive on Mars at its own permafrost in the polar regions. The permafrost sample that was used in the experiment came from permafrost that had not melted in 2 million years, which means that the bacteria found within it were capable of staying alive for at least that long. Since the research showed that the bacteria populations were capable of stabilizing themselves, it is not inconceivable that microorganisms on Mars could survive for 2 million years or longer in their own permafrost as they maintain a stable population capable of repairing the genomes and preserving themselves. This research goes beyond Mars because it can help us to understand where to find microorganisms on other planets and moons within and outside of our solar system. Europa, one of the moons of Jupiter, potentially has an ocean underneath the thick layers of ice on its surface. It is also exposed to radiation, similar to Mars. While not the same, the potential for life to survive on Europa exists and more research like the one here could shine a light as to what kind of life could survive beneath the ice of Europa. As with any other science experiment, more supporting data and experiments would be done to increase the accuracy and credibility of this work. Despite this, it remains a very hopeful prospect for the kinds of life we might expect to see when we land on Mars.